I have modified the USB device history EnScript a little to generate a error dialog box if you do not have a case open when trying to run the script and if you run the EnScript with multiple pieces of evidence, the output is now separated and a line at the top of each output indicates where the information was obtained. A friend of mine who has a private forensic consulting firm received a phone call today from a guy who started rambling on talking all sorts of crazy talk. After hanging up on the guy, he proceeded to call back about 20 times and eventually left three voice mail messages. The only editing I did was to remove his phone number from the recordings and part of his name to protect the innocent, guilty, mentally insane or heavily drugged..
Those of you in LE know these types of calls are pretty common to dispatch, etc. But these just struck me as "extra" funny! Warning: There is some profanity in the messages. Also be sure and empty your bladder before listening. A reader contacted me about the possibility of exporting the hashes used by the SearchPak program made by ADFSolutions so they could be imported into EnCase, as he had several hundred thousand hashes in the SearchPak program. I asked for a sample of the file that contains the hash values in the SearchPak application and found they are stored in a XML type text file with a ".spak" extension. 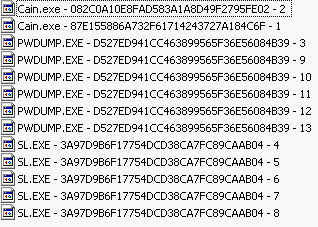 I wrote a quick EnScript that parses the XML type .spak file and then exports all the hashes to a text file in the default export folder of EnCase. You can then use the EnScript I previously wrote here to read hashes from a text file and create a EnCase hash set. *Edit 11/20/07 - For clarity, I renamed this blog to Vista VSS information since that is actually the information I am trying to extract, not the System Restore Point information. Windows Vista introduced several new features, one of which I think will have a huge impact on computer forensics, that being the "Previous Version" feature. The "Previous Version" feature uses the Volume Shadow Service present in Windows 2003, but brings it to a new level by making block level copies of clusters that can contain user files (documents, images, etc). I have been looking into the new VSS storage method and I think I have found a way to extract some good information about the VSS (step one). Then once I get that figured out, I hope to write an EnScript that might be able to extract the files that have been stored inside the VSS. This is where I need some assistance from those who have a either running Vista machine with EnCase loaded or image file of a Windows Vista system that can be viewed in EnCase 6. I have written an EnScript to highlight a record of information in the VSS files, but I am not sure yet what the various differences can be based on types of machines, number of drives, etc. So I am asking for assistance by downloading and running the EnScript below and then submitting that back to me so I can compare the various records to see what the differences are. The EnScript below searches for a record identifier, then bookmarks possible valid records. It also exports the record to a raw file in your default export folder (one file for every valid hit). My Initial research shows one record is present for each VSS file in the "System Volume Information" folder. The EnScript is not compiled and is readable by anyone, so you can see what it is doing. I have heavily commented each line of code to explain what the EnScript is doing, line-by-line. It is fairly simple. It is looking for a hex value present at the beginning of each record, then reading a value which indicates the length of the record and then bookmarking/exporting that record. The record does not contain anything I consider super-sensitive. The record does contain the name of your machine, the workgroup/domain it belongs to, your machine GUID, some timestamps, the VolumeGUID and the label of the volume. If you are uncomfortable with sending me this information, thanks for your interest, but stop here. For those willing to send me this information, please download the EnScript below, preview/load a Windows Vista system in EnCase 6, select all files with GUID names in your "System Volume Information" folder and then run the EnScript. Once completed, look in your default export folder (C:\Program Files\EnCase6\Export), review the contents to make sure you are comfortable with sending me the contents. Feel free to edit any of the Unicode strings (machine name/domain name, etc) in the exported data with an editor to redact anything you don't wish to share with me, just be careful to preserve the original format of the record. If you are then comfortable nothing sensitive is contained in the files, zip up the exported files and send them to me at lance (at) forensickb.com. I will not be sharing any of the submitted files with anyone else. Please indicate when sending information, what version of Vista it is. Those of you who participate and send me exported data, I will send you beta/final versions of the EnScript as a token of appreciation for your assistance in its development. 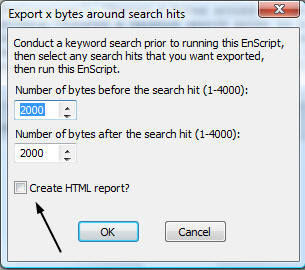 A few weeks ago I posted an article and EnScript to export x bytes around a search hit. You can read about it here. I received an email from a reader asking if I could modify it to create an HTML report of the search hits, with the search hit being highlighted in red and then some additional information in the report. Seeing how there was nothing interesting on TV, I took the time to modify the existing script to create an HTML report. Run your keyword search against your evidence. Once the search is complete, view your search hits, then select (blue check) the ones you want to export (one, many, all). Then run the EnScript. The EnScript will take each search hit that you have selected and carve out the text around the keyword depending on the before and after integer values you provided (2000 before and 2000 after is default). This new version will also create a simple HTML "Proximity Report" in your default export folder if you select the "Create HTML report" check box on the starting menu. The HTML report is nothing fancy, but I guess it serves the purpose. I have been following the development of several tools to extract evidence from memory dumps of live machines. There have been several tools developed to assist with this, including several listed on Andreas Schuster's blog. Traditionally, examiners would run the "strings" command against collected memory dumps (if they had them) and that was it. In the past two years some tools have been developed and showcased during the DFRWS and other various conferences. Some of the tools attempt to extract the running process list from the captured memory. I decided to start developing some tools in EnScript to extract information from memory dumps. I have 'tools' in mind that I want to develop and this is the first one. This EnScript will search any selected (blue checked) file in EnCase for MFT records, based on the MFT record header of FILE* or FILE0. Once found, the EnScript will attempt to parse out the Standard Information Attribute for the timestamps associated with the file/folder and then all Filename Attributes for the name of the file and the associated timestamps stored in the Filename Attribute. The idea behind this EnScript is that there may be MFT records in memory (typically thousands) that are of interest to you, such as malware or hacking tools, etc. Any successfully parsed records will be written to the console and also bookmarked. Typically, memory dumps are collected as one large 'dump' or file that contains the contents of memory. If you add that file into EnCase (drag and drop into an open case), then select that one file and run the EnScript, all parsed records will be displayed in the console and bookmarked. It currently parses any found MFT records for the Standard Information Attribute data and also the data contained in the Filename Attribute, including the filename and associated timestamps. The EnScript currently does not parse out directory entry contents. Each directory has its own MFT record (which will be parsed), but the contents of that directory is either stored as resident data in the MFT record or as non-resident data in a INDX buffer. Currently this EnScript does not parse and display the contents of directories. After being gone out of the country for nearly 6 weeks, I finally have some time to continue this tutorial. The next step is to use conditional control structures to select only certain files based on certain criteria. As the EnScript recurses the evidence, it will evaluate each object in the evidence to see if the name field is equal to "system" by answering the questrion of is it "ture" or is it "false". If it is "true", then any code in the curly braces will execute. It is important to note that this type of evaluation is case-sensitive and must be exact, so "System" or "System.dat" evaluate to be false with a file named "system" and the code in the curly braces would not execute. In the above code, we have inserted the "IF" statement, but notice there are no curly braces as shown above. There are two ways to do control statements, the first is to use an opening curly brace and then a closing curly brace, putting any code you want to execute if the evaluation is true, inside the braces. The second way is to not use any curly braces and then if the conditional statement evaluates true, then the very next line will be executed. If it evaluates to false, then it will skip the very next line. So in the example above if "if (entry.Name() == "system") is true, then the next line "Console.WriteLine" will execute. If it is false, then that line will be skipped and the script will effectively end, but if there were additional lines of code after the Console.WriteLine command, then they would execute, but in this case, there are not, so the script ends. In this example, as the EnScript recurses each object in the evidence it will evaluate the name field to see if it "contains" the letters "sys". If it does, then it evaluates true and the code inside the curly braces would execute. The Contains() function is not case-sensitive and it does not matter where the string fragment is located inside the initial string. The file name "system.dat" would evaluate true, as would the file named "mmsystem.dll" since they both have "sys" inside them somewhere. To learn more about internal functions such as Contains(), you can select the EnScript Types from the "View" menu. The Contains() function is a member of the String Class. If you look in the String Class, you will see the Contains() function and a brief syntactical explanation of its use. The Compare() function returns a non zero value for any text which is lexically less than or greater than the test you are looking for. If the text is exactly the same, the Compare() function returns a zero (I know, it seems reversed since a zero traditionally means false in Boolean). This is why there is a "==0" at the end of the statement. This statement would evaluate true only if the file name was exactly "system", not "System" or "system.dat". Once you have used an control statement such as "IF", you probably want to do something with that file, like read text from it or bookmark it. In this tutorial I will introduce the method to bookmark a specific file based on some type of criteria, such as the examples above. In future tutorials, I will detail how to open and read data from a file (file I/O). The first line creates a variable named "folder" of the BookmarkFolder Class type. Then, the second line instantiates (creates) the object named "folder" in the root of the bookmark tree, naming it "My BookmarkFolder". The second segment are the inputs that the function expects to tell EnCase WHAT to bookmark, WHERE to bookmark and how to name the bookmark, as well as how to display it in the bookmark tab. The first input (entry) is the entryclass object that you want to bookmark. The second input is where do you want to start the bookmark from, in this example, from the beginning of the file (zero). The third is the ending bookmark offset. In this example, to the end of the logical file. This EnScript will recurse all evidence and look at each object for a file name or folder that is exactly "system". When found it will then bookmark that file/folder from the very beginning of the file to the end of the logical file. After running this EnScript, you should have a bookmark folder named "My BookmarkFolder" in the root of the bookmark tab and any files that matched this criteria, would be bookmarked in that folder. This is the second part of the EnScript tutorial I started in September 4th, 2007. In the first part, we reviewed what the differences are between EnScripts, Filters, Conditions and Queries. In this part, we will begin to learn the EnScript programming language. First, I want to review the various panes in EnCase and their respective names so when I refer to a particular tab or pane, you understand where I am referring. 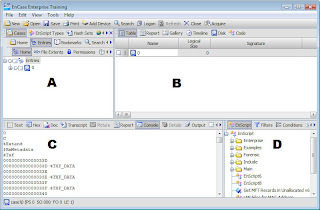 The EnCase program is generally divided into four panes or sub-windows. The upper left pane (A) is referred to as the “tree pane”. The upper right pane (B) is referred to as the table pane. The lower left pane (C) is referred to as the view pane and the lower right pane (D) is the EnScripts/Filter pane. The table pane generally shows you all the “objects” or files & folders in a particular piece of evidence. The view pane is used to see the contents of a specific file or folder in various formats (text, hex, doc viewer). What programming tutorial would be complete without the traditional “hello world” programming example? In the EnScript pane (lower right), make sure the EnScript tab is active and then right-click on the root of the EnScript tree that is displayed. Select “New” and then name the EnScript “Hello World”. A new EnScript should be created with the name you provided. 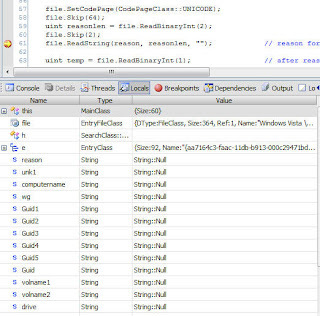 The table pane (upper right) should have automatically made the “code” tab active and you should see the minimum EnScript code generated automatically by EnCase. As I mentioned in the first part of this tutorial, this is the minimum amount of code that must be present in order to be a valid EnScript. This EnScript will run, but will do absolutely nothing. Every EnScript must have a Main Class as well as a function called “Main”. Take a look at the opening curly braces and then the corresponding closing curly brace. The Main function is contained inside the Main class. In this EnScript, line two and three makeup the entire Main Function, while lines one and four are the beginning and ending portions of the Main class. For now, lets focus on the Main function. Absent a constructor, which I will explain later, the first line of the Main function is where this EnScript begins execution. Line two “void Main (CaseClass c)” is where it will start. When this EnScript begins, the EnCase program is going to hand your EnScript one variable, named “c”. This variable is of the CaseClass type. This means that when you program begins, you will have a reference to the case that is open and active in EnCase at the time the EnScript was executed. CaseClass refers is a type definition describing what type of variable “c” is. With this one variable, you can obtain additional references or pointers to all the other information you may need in your EnScript. This is your starting point. Generally, program execution stops with the corresponding closing curly brace of the Main function (line three). • White space is generally ignored (the exception is when inside double quotes). So putting extra spaces between lines of code means nothing and it can help to logically separate various pieces of your code . • To make comments in your code (for future reference or explanation) you can comment one line of code using two forward slashes “//”. Everything after that will turn blue and be ignored at run time. To comment blocks of code, you can use the ANSI C commenting style of a “/*” and then end your commenting block with the opposite “*/”. Anything in-between those markers will turn blue and will be ignored. Those markers can be on the same line, or then can be 100 lines apart and everything in-between will be ignored. • Control-F can be used to find specific text in your EnScript. When working with small EnScripts, finding text is not too difficult, but with larger ones, it helps to find variables, functions or specific text. The definition of recursion in the programming world is a piece of code that calls itself. When the EnScript language initially came out, you had to use a recursion routine in order to process or list all the files/folders in the evidence. The current version of EnScript makes it much easier. In order to list or process (do something) all the files/folders in the evidence, you first need to create an object that contains a pointer to the top level of the evidence. Information that is listed in the table pane (upper right) windows are members of the EntryClass. The previous script did not require a case to be open because it was simply writing to the console. The remainder of this tutorial will require you to have a case open and some evidence loaded. This code would clear the console, then assign the first object (the first physical or logical device in the evidence)in the evidence to the EntryClass variable named “entry”. Then the next line will print the name of that object out in the console pane. This is a good beginning, but this only gets us the first object in the evidence. What if we want to print out every file/folder name int he evidence? Luckily there is a internal function that makes this *very* simple. If you are familiar with Perl, you should be familiar with "forall" function that goes through a list or array, one object at a time. In EnCase it works the same way by going through every object in the evidence given the top-level object. This code clears the console (line 3), then receives the top-level object in the case and assigns it to the variable named "entry". It then executes all the code after the forall statement until the closing curly brace (line 5), then goes back to the forall statement and gets the next object in the case and runs the code in between the curly braces again, until all the objects have been processed. If you look in the console tab, you should see a complete listing of all the file/folder names from all of the loaded evidence. This technique is a foundational technique that will be used to list/process all files in a case. In the next tutorial, we will begin to identify and process file/folders based on certain criteria. This will be the first tutorial in a series in an attempt to try and teach some basic EnScript concepts. First, some disclaimers: I am not a programmer by profession. I have learned the EnScript language out of necessity to automate processing of evidence and have since written many EnScripts, some of which are now part of the public release version of EnCase and some of which are given to students during EnCase training, but I certainly don't consider myself an expert in writing EnScripts. The purpose of this tutorial is to try and provide some basic concepts and instruction to an EnCase user who also does not have any programming experience so they can write some basic EnScripts and/or modify existing ones for a specific need. I have been teaching various EnCase training classes for almost the past 5 years and it amazes me at the answers I get from students when I ask about EnScripts, Filters and Conditions. Most know they are in the lower right pane of EnCase and many know some of the “canned” EnScripts that everyone seems to use (Initialize Case), but very few can describe filter, conditions or queries. So lets first discuss these four topics so you understand their differences and understand which may be the better solution to your automation need. The EnScript tab gives you access to the built-in EnScript editor and allows you to see the code for the EnScript, as long as it isn’t compiled (EnPack format). An EnScript is the most powerful automation feature but it is also the most raw. “Raw” meaning that the EnCase software does very little for you automatically and your EnScript is responsible for doing everything you want to do, unlike a condition that we will discuss later. The EnScript programming language is very “Java-ish” and C++. If you have any experience with those two languages, then learning the EnScript language should be a snap. An EnScript can do almost anything you want. It can access just about everything you the user can access or see inside EnCase. It can create folders and files on the local file system (not the evidence, the evidence file can never be altered via EnCase). In the Enterprise Edition, it can create directories and files on remote machines as well as delete them. It can also execute other win32 programs. This code will run, but does absolutely nothing. It is just the absolute minimum code that must be present to be a valid EnScript. When writing an EnScript, you are responsible for writing everything else. EnCase does nothing automatically for you. A filter is an EnScript. It is the same language. The only difference is that a filter is designed for a specific purpose, to filter what you see. The original concept was to filter our files/folders based on some type of criteria; i.e. file extension, size, name, whatever. EnCase treats filters a little different than raw EnScripts. This is because EnCase is actually doing some work behind the scenes for you in an effort to “filter” what you see in the evidence. The code in a filter can do just about anything a raw EnScript can do, but it must answer one important question. Do you want to see files/folders (called entries) that match your criteria? If you do not answer that question in your code, your filter will not run. There are two major differences between this code and the code presented above. First, the parameter being passed to the main function is different (CaseClass c vs. EntryClass entry) and the second being the one added line that states, “return true”. This line is responsible for answering that question I mentioned above, “Do you want to see this entry or hide it from view”? So with a filter, EnCase gets every entry in all your evidence, one by one and then executes this code for every entry. It reads the above code that says “return true”, meaning show me this entry. EnCase then gets the next entry and does it again, until it goes through every entry in your evidence. If you have 20,000 entries in a piece of evidence, then this code will execute 20,000 times. If you changed the line to say, “return false”, EnCase would hide every single entry from your view until you removed the filter. A condition is exactly the same as a filter, except you don’t need to know how to write EnScript programming language. The condition tab allows you to use user-friendly criteria or selections to automagically write a filter. By selecting certain criteria, such as name, contains, “mytext”, EnCase will automagically generate the necessary EnScript code to perform that filter. A query is nothing more that two or more filters put together. The filter and condition tab have a limitation that only allow you to apply one filter at a time. 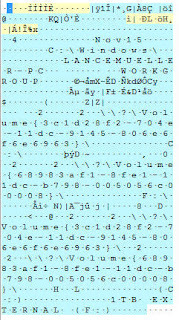 By using a query for example, if you have a filter that only shows you files that are larger than 10,000 bytes in size and another filter that only shows you files with the extension of JPG, you could create a query that would take those two filters and apply them simultaneously, the result would be only files with a JPG extension whose size is greater than 10.000 bytes would be displayed. In the next part, I will begin to explain the EnScript programming language and how to perform simple actions. I recently read a post on a listserv asking if there was any easy way to find files in an EnCase evidence file based on just the filename and then export those files out. This can easily be accomplished by creating a condition and then when applied, only the files matching the filename(s) you specified will be displayed. The files can then be selected (blue checked) and then exported out. But what if your filename list contains 5000+ filenames? Well, I tried to create a condition with that many filenames and EnCase choked. That's because it actually writes the filenames that you paste into the text box into the code the condition makes, thus causing several thousand lines of code to be created. So I wrote an EnScript that will do this pretty quickly by reading a simple (non-Unicode) text file containing one filename per line, and then recurses through all the loaded evidence and bookmarks any files that match the filename(s) you provided in the text file. I added an "Export" check box that will automatically export the found files to the default export folder, if selected. 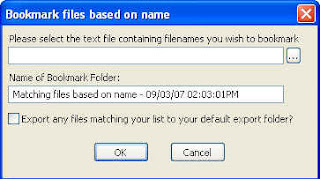 It will also hash the found files and then when exported, rename the file to the original filename with the hash appended so you could sort in Windows Explorer and then see if two or more files with the same name are duplicates or different. The console will report how many filenames were read from the file you provided and the full path of the files that match. This EnScript actually has some useful application in Intrusion type investigations. I am constantly struggling to keep an updated hash set of hacker tools. Every time a new tool version is released I have to make sure and add that into my hash sets. Many times though, I have found that the intruder does not even rename his/her tools, he/she instead just hides them somewhere where we will never think to look (the system32 folder ;). This EnScript is compiled (EnPack) so it will only work in V6. Import a text file of Hash values into a EnCase hash set. In July, I posted an EnScript that I wrote to import a text file containing the name, size and hash value of file(s) into a EnCase hash set (You can read it here). The EnScript will create a .hash file in your default export folder that can then be copied into your EnCase\Hash Sets\ folder and used inside EnCase. A recent post asking how to obtain the MAC address of a non-running machine prompted me to write a quick EnScript to pull the data from the end of Link (LNK) files. The EnScript is nothing fancy, it simply recurses through all .LNK files and grabs the MAC address at the end of the .LNK file and prints it to the console. When doing intrusion investigations, I have run across IIS web logs that have encoded entries that were the product of a SQL injection attack. Many times the attacker will encode the web request that is sent to the webserver and then subsequently to the SQL server by using ASCII values for the characters or HEX values. There are several reasons for doing this and there are several automated tools that an attacker can use that will automatically encode the string he/she wishes to send. "id=999999 or select * from cctable"
This type of encoding makes reading and understanding what type of SQL commands the attacker is sending, very difficult. So I wrote an EnScript that does a simple search and replace for seveal types of encoding in order to make it easier to understand what the attacker was doing. This can also help in keyword searching in case the word you were searching for was encoded it obviously would not be found in its encoded form. 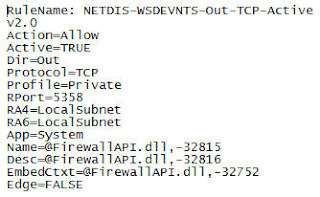 To use within EnCase, select (blue check) the IIS log and then run the EnScript, check the console for results. One of the many analysis techniques that I use when looking at compromised computers is to analyze registry keys and the last written date on the various keys. If I have a time frame that I am focusing on based on some other type of artifact, I commonly look at all the registry keys that have a last written date near my target date. 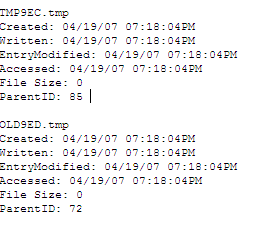 I wrote an EnCase EnScript to mount the registry hives and then dump all the registry keys and their last written dates into a Bookmark Log Record view so I could then sort them, export them, print them or whatever. Commonly I used to just mount the registry hives and then select the "show all" and then sort the files and registry keys at the same time and in the same view. That method is still a valuable one, but I wrote this so I could make bookmarks and separate the registry keys into their own bookmark area for closer analysis. To use this EnScript, copy to your EnCase EnScript folder and then refresh your EnScript folder in EnCase (if EnCase is currently running). Simply double-click on the EnScript and it will mount the registry hives and dump the data in the bookmark tab, log records subtab. *Note that the Bookmarks->Log Records tab has a hard-coded column named "Last Accessed", although registry keys only have a last written timestamp. I have populated that column with the last written timestamps. In almost every forensic report that I write, I include the OS type, service pack level and patches that have been applied to the OS. This information sets the foundation as to what level of OS is installed and starts to give indications as to what is possible in terms of exploits against this machine. This is a quick EnScript I wrote to extract this information from the registry and print to the console tab of EnCase so I could copy and paste all or a portion of it into a forensic report. A colleague in South Africa (peace OB) asked me for a script that could quickly kick out MS Word MetaData to the console and bookmark them for review. This is a pretty specialized EnScript, but I figured others may have the same need. A lot has been written about the UserAssist keys and their value, no need to repeat the same mantra. This is an EnCase EnScript I wrote several years ago to decode and bookmark (and export) the UserAssist keys for all users. Obviously something is not right. Recognizing a icon like this is an easy way to identify problems. Now, there are other ways to probe a file and determine its purpose , but I wrote this script to kick out all the icons in selected (blue checked) executables so I could quickly visually scan them (low-hanging fruit). If the executable does not have an embedded icon, then nothing is exported. Additionally this could have some very interesting applications by creating a hashset of just icons. Then, regardless of the file's hash itself, by extracting and hashing the icon, you could possibly identify files by the icon alone, regardless of what the overall hash is of the file. This possible negates the issue of different hashes caused by different versions of the file as well as if the file has been altered, packed or compressed with a runtime packer, thus altering the file's hash. To install, just copy the EnScript to your EnCase EnScript directory and then double click. It will ONLY process files that are selected (blue checked. It skips files that are selected, but not EXE). All icons of selected executables are exported to your default export folder in .ico format so you can set your Windows Explorer folder view to thumbnails and view them quickly. I recently presented at CEIC 2007 on Microsoft Windows Vista forensics. The presentation was a brief overview of new features and artifacts that Vista creates as well as some changes in the way Vista does certain things, such as Windows Mail, the recycle bin, etc. When Norton 7.5 (Corporate) locates a file it recognizes as malware, if quarantine is enabled, it will encrypt that file using XOR and rename it with a .VBN extension. It is important when doing an investigation that you examine the quarantine logs and extract any files that are quarantined so you can obbtain a hash and perform an analysis. When a file is quarantined by Norton (and XOR encrypted) it will not be located by an external AV scan, or by any type of hash analysis because it is now in an XOR encrypted state. This EnScript recurses through any files with .VBN extension and then decrypts the file and exports it so you can scan it or obtain a hash. A few years ago, I was asked if there was a way to use EnCase Enterprise to connect to a remote machine that may be located behind a firewall. The scenario I was given was what if an Investigator wanted to connect to a computer located inside a Internet Cafe to collect information during an investigation, but didn't want to solicit the help from the Internet Cafe owner/employee? I came up with a simple way to accomplish this with no regard to the legal ramifications since that was not part of the problem presented to me and should be considered by the person performing this. 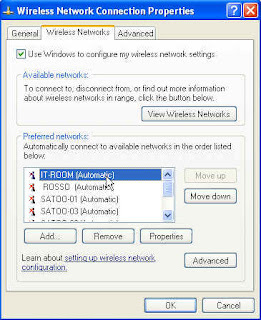 In addition, this solution requires that someone (an additional investigator) enter the Internet Cafe and have physical access to the computer you wish to preview or collect information from. Administrative access is not required and there is no need to install anything or reboot. The scenario would be something like an investigator doing surveillance on someone who uses an Internet Cafe and then when that person leaves, an investigator would enter and pretend to use the computer that the suspect just used. The investigator would use a floppy disk or flash drive to start the necessary applications and config and then a remote investigator could connect to the computer in the Internet Cafe using EnCase Enterprise and collect information (image, preview, etc.). *Note: This solution was originally written several years ago for EnCase v4 and works in all subsequent versions, but in EnCase v6 there is an easier way to accomplish this with no need to use 3rd party software (SSH), but administrative access is required to the machine you wish to preview.